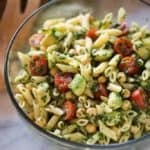 This Spinach Avocado Pasta Salad is not only DELICIOUS, it’s packed with vegetables and protein for a healthy meal or side dish. I love meals that taste great and leave my feeling full, for longer. 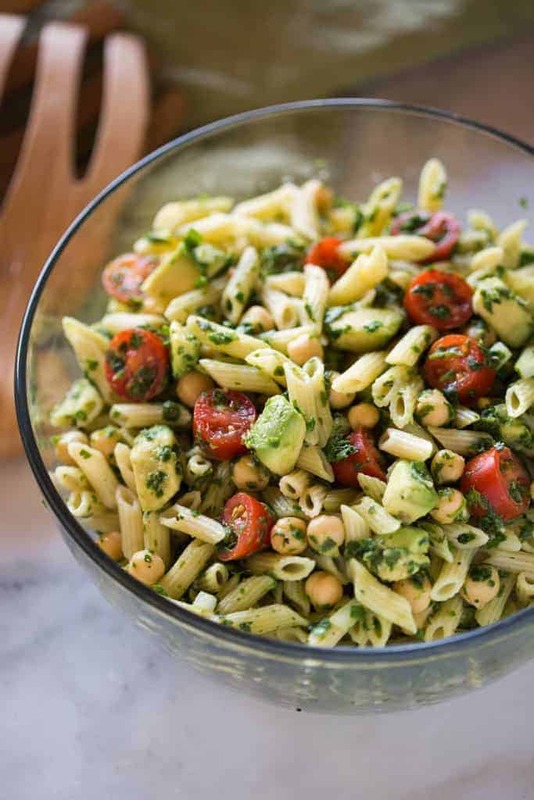 What’s not to love about this hearty, healthy Spinach Avocado Pasta Salad? Tomatoes and avocados: make everything better. This salad just works. It’s a beautiful blend of flavor and color and it’s completely delicious! Pasta salad always hits the spot! I love it, and my family loves it, so I make different versions all the time. The one thing I really love about this salad, in particular, is how fresh and healthy it is. It’s filling too! The yummy, light lemon dressing adds the perfect touch of sweetness. I love to make extra to have in the fridge to feed everyone throughout the week. 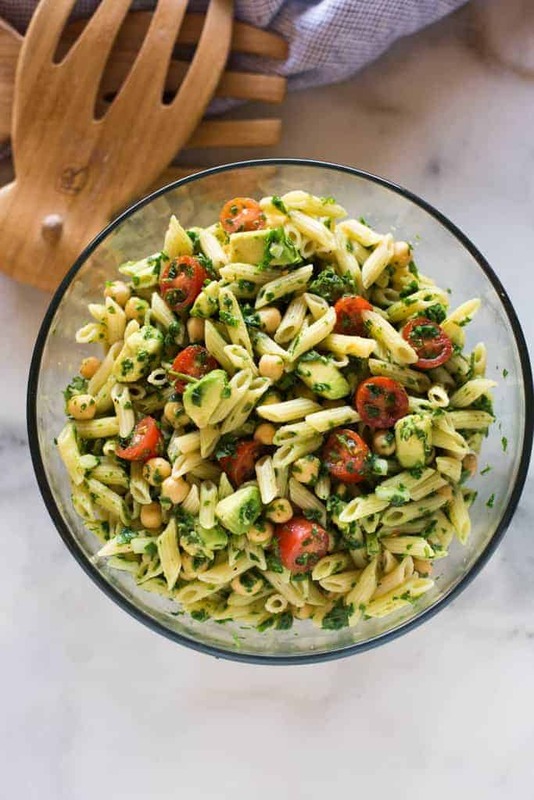 This Spinach Avocado Pasta Salad is not only delicious, it's packed with vegetables and protein for a healthy meal or side dish. Cook pasta according to package directions until al dente. Drain pasta and set aside. 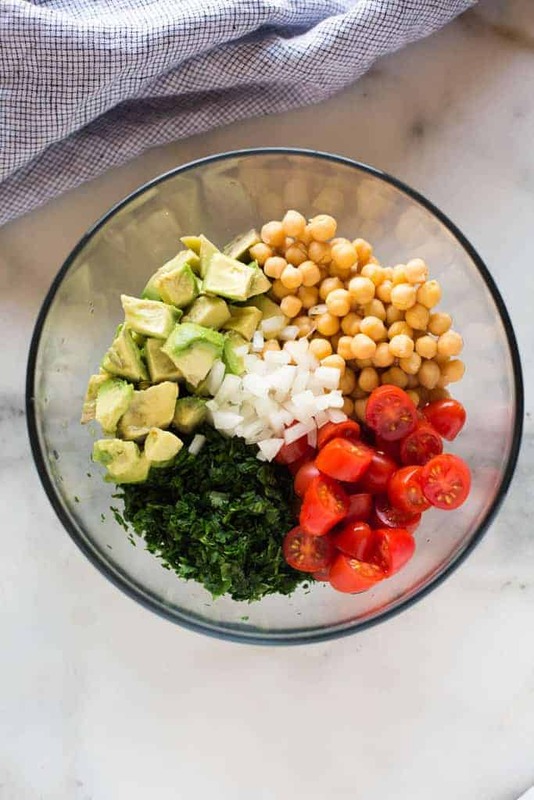 Place cilantro and spinach in a food processor and pulse a few times until they are finely diced. Add to a medium bowl. Stir in the garlic, onion, tomatoes, avocado, and beans. Add the cooked pasta, and stir to combine. Make dressing and pour over the top. Toss to coat. Refrigerate for 15-20 minutes to allow flavors combine. I originally shared this recipe July 2015. Updated January 2018. I LOVE that you added avocado!! I bet it would be just as delicious with GF pasta! I love pasta salad! I make it a lot too. This recipe looks delicious. Pinning! That sounds and looks delicious. A great summer dinner! What amount is consided a serving is a serving? Hi Deboarah, there are 5 servings in this recipe with each serving being about 1.5 – 2 cups. Hope you get to make it soon! What’s great about this dish is that it can be used as a main dish, or a side. We have done both! It’s a perfect summer recipe and a great addition to any BBQ.